This thermistor sensor design is ideally suited for animal and biological studies, geographic and oceanographic applications, and wherever a rugged thermistor sensor is needed. 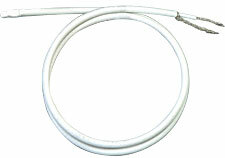 Nota: For additional cable length, add required length (in inches) to the end of the Model Number and add £1.75/m to the price. For a phone plug connector, add "-PP" to the Model Number and add £4.70 to the price.